The Earth's natural resources are finite and easily compromised by contamination from industrial chemicals and byproducts from the degradation of consumer products. The growing field of green and sustainable chemistry seeks to address this through the development of products and processes that are environmentally benign while remaining economically viable. Inorganic chemistry plays a critical role in this endeavor in areas such as resource extraction and isolation, renewable energy, catalytic processes, waste minimization and avoidance, and renewable industrial feedstocks. Sustainable Inorganic Chemistry presents a comprehensive overview of the many new developments taking place in this rapidly expanding field, in articles that discuss fundamental concepts alongside cutting-edge developments and applications. 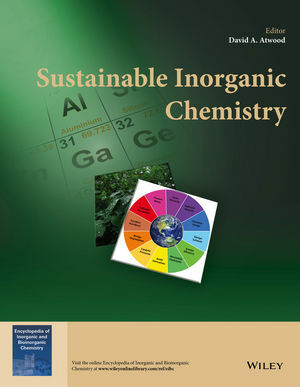 The volume includes educational reviews from leading scientists on a broad range of topics including: inorganic resources, sustainable synthetic methods, alternative reaction conditions, heterogeneous catalysis, photocatalysis, sustainable nanomaterials, renewable and clean fuels, water treatment and remediation, waste valorization and life cycle sustainability assessment. The content from this book will be added online to the Encyclopedia of Inorganic and Bioinorganic Chemistry.